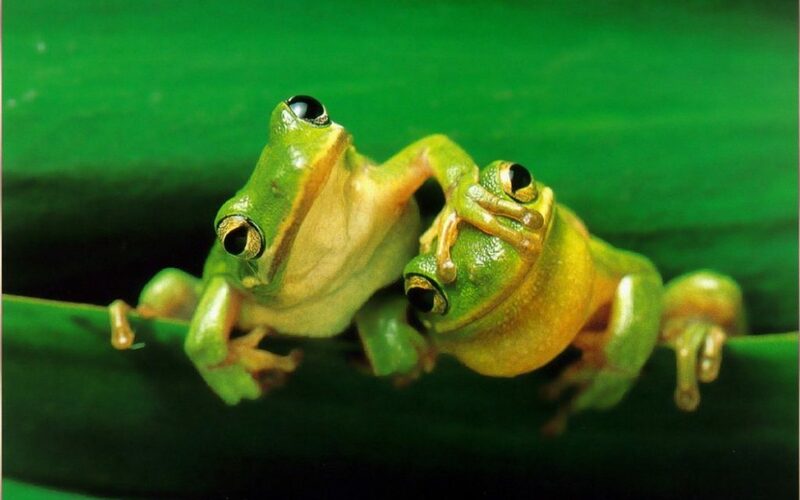 Today is Save the Frogs Day. That includes the frogs that get you out from under yarn projects that you have decided you no longer want to pursue. 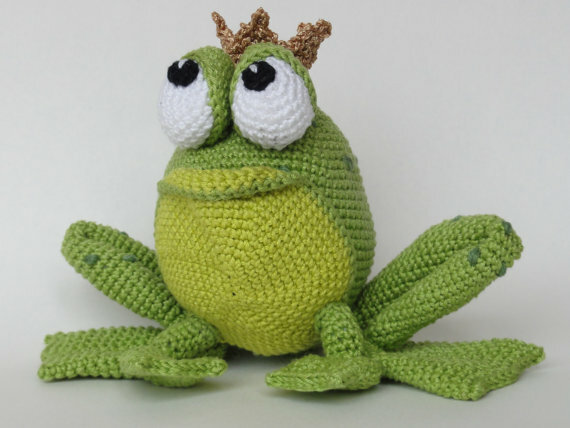 No, not that kind of crochet frog, although Henri is really cute. I have a giant granny square blanket in progress. It’s a fairly random looking blanket with many colors, because I use leftover whole and partial skeins to make it. Sometimes I double up thinner yarns. I like how it looks and it’s a nice way to use up leftovers. Plus once it is blanket size and under a duvet on my bed, no one will know. ? 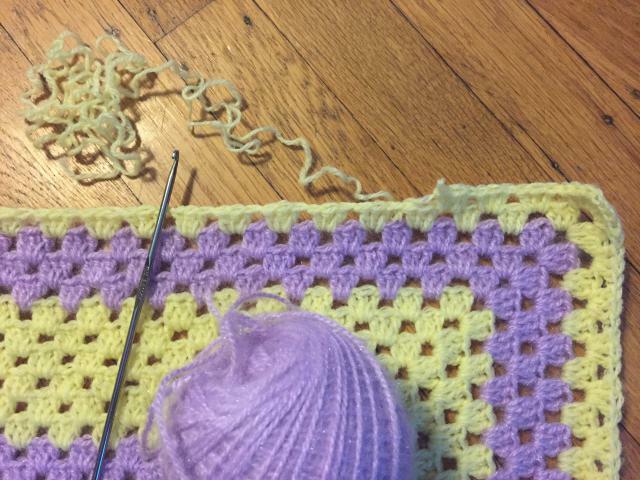 That’s the purpose of granny squares, or so I’ve always thought, to use up leftover bits of yarn. It’s amazing how some people are so gifted at taking the ordinary and turning it into the extraordinary. I have been contemplating starting a granny squares throw to use up my stash too. Maybe this’ll help kickstart me. Hmmmmmm….it’s a three-day weekend here, maybe I’ll sort through my stash…. Granny squares were the only kind of crocheting that I was ever any good at (my edges tended to wander in and out on everything else), but they never looked like that. You’ll have to post your mystical lanterns when it is done! Yep. I even did one. Then I decided I didn’t like the colors and gave it to Krissie. It’s an amazing pattern. I am a by nature a knitter although I have crocheted a bit, especially really adorable baby hats at one point. But I think that I am too linear to really be good at crochet. I can do all kinds of fancy knitting, but crochet tends to just get away from me. I end up with unrecognizable blobs and random chains. The outright art pieces in fiber arts I’ve seen are often made from crochet; I do think the craft lends itself to extraordinary three-dimensional creations. In a space opera genre book that I like by Sharon Lee and Steve Miller, Fledgling, the young heroine learns to understand space, mathematics and piloting by crocheting what she’s learning into a visual form that helps it to make sense to her. A colleague in our math department crochets to understand whatever topic in math he’s pursuing. Also, I think it keeps him sane in faculty meetings, which threaten the sanity of pretty much everyone involved. I was never good with anti-anxiety meds, I just don’t have the chemistry for them, so I picked up my old hobby of crochet again. It does wonders. I think it’s the rhythm and the repetition and the freedom of it. You can do damn near anything in crochet. You also frog it aka rip-it rip-it, when you unsew in quilting. I actually had a bit about that in here and deleted it in favor of Kermit. Frogging plays a big part in my crochet life. Frogging has been a part of my life, regardless of what craft. Except, of course, beading where you just snip through the threads, and then spend a lot of time sorting beads…. Kermit was the better choice. I have a small pond (about 4′ x 6′ x 4′ deep) in the middle of my garden. Lots of frogs live in it, along with the few goldfish I put in there on purpose and some efts that showed up later. I have to rip the whole thing out this year and have it redone, and I am actually going to have to save the frogs. Go figure. Yes! We have real frogs, too, in a corner that makes a pond in the spring. We ended up paying more for mechanical mowing, but it’s worth it to us to save the frogs and keep possible carcinogens away from us. By the way, I hate mosquitoes, so I had planned to dry up the pond anyway by planting willow trees, but they suggested we could always dig the pond *deeper* and make it less attractive to mosquitoes and bring in more wildlife. So that’s a thought, too. Melissa, please quantify ‘deeper’. We have a man-made pond that is about 50cm deep. Water flows in and out from small springs. I don’t know if it is the depth that works or the flow. I can’t imagine that mosquitoes breed in flowing water, just standing water. My sister owned a townhouse a couple of years ago that was next to a wetland that was part of a state forest. In the summer, the frogs from the wetland would try to get to another swampy area nearby, which meant crossing a couple of paved roads (with predictable results). Our dogs loved, loved, loooovvvved hunting the frogs, though we would never let the dogs catch the frogs (since we didn’t know what would happen to the dogs if they did).